Today the Wall Street Journal said "Consumer Credit Surged in November". Is this an indication of a sudden pickup in consumer spending? Increased bank lending? Maybe not. Here is a quick breakdown of this "surge". The total amount of the increase was $20.4 billion on a seasonally adjusted (SA) basis. 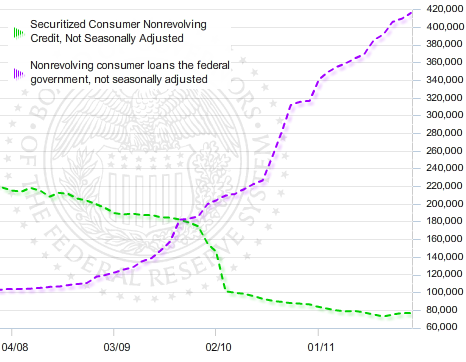 Typically the Fed breaks consumer credit into revolving (credit cards, etc.) and non-revolving (car loans, student loans, etc.). This number does not include real estate loans. The revolving credit component was up $5.6 billion (SA) - a healthy increase but by no means extraordinary. Consumers did a bit more Christmas shopping in November. The big increase however came from the non-revolving component. The number was $14.8 billion (SA). And a large portion of those non-revolving loans actually came from the federal government. The only type of consumer credit the federal government provides directly that could be in these numbers are student loans. And student loans generally do not flow directly into the economy- at least not directly. In fact in the last 3-4 years non-revolving credit has been fairly steady except for two components: securitization and the federal government (student loans). The federal government has in effect stepped in to compensate for some of the drop off in the securitization markets (what some refer to as the "shadow banking"). So as exciting as this "surge" in consumer credit may be, it is important to keep in mind that a large component of the increase is sponsored by the taxpayer and ends up paying tuition instead of contributing to consumer spending.